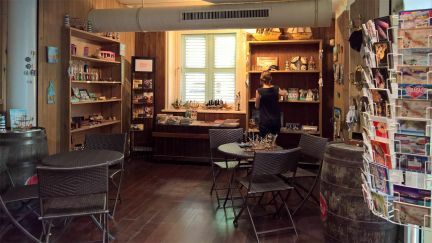 The shop in the museum has a large assortment of maritime souvenirs, which are nowhere else obtainable on Curaçao. Besides, our shop is the only bookstore in the city centre of Willemstad with a large collection of books. The Curaçao Maritime Museum and Caribpublishing present a new series of books: "The Rich History of Curaçao". The books are written in an easy to read style and in addition contain many historical facts and touching anecdotes. The books are not only educational but also fun to read! The first part is called "Indians, the WIC and Invasions." This book is an excellent starting point for anyone who wants to learn more about the history of Curaçao. In easy to read chapters the following topics are covered: form the first inhabitants - the Indians - to the discovery of the island, the West Indische Company (WIC), the slavery to the many invasions and famous and infamous people that all have left a mark on the island. The second part is called "The sea, trade and shipping" and covers the maritime history of the island in 17 themes. What makes the port of Curacao so unique? What has the sea brought this island? But also: how did life on a ship of the West India Company look like? After reading this book it is clear that without the unique port of Curaçao history of this island would have taken a very different course. The first two parts of the series' rich history of Curaçao are now on sale at the museum, at caribpublishing and at the local and online bookstores.